The Canon EOS Rebel T1i 500D has ISO speeds from ISO 100 to ISO 3200 in one stop increments, along with two extra high speed ISO settings namely H1: 6400 and H2: 12800. It is scheduled for delivery in May 2009, at an estimated "body only" price of $799.99 which for once doesn’t include the usual EF-S 18-55mm f/3.5-5.6 IS kit zoom. If you happen to want this lens it will cost you an additional $100. In Europe, the recommended retail price for the Canon EOS Rebel T1i will be around £869.99 / €999.99 for the body and £969.99 / €1139.99 for the kit including 18-55 and VAT (why oh why is it so much more expensive here in the UK)? There is also an additional 500D kit (with a better lens in my opinion) with the EF-S 18-200mm f/3.5-5.6 IS lens priced at £1399.99 / €1639.99. For those struggling to find the necessary funds for the funds for the EOS 5D Mark II, this could be the answer to your dreams and fits quite snugly in between the 5D and 5D Mark II with is great sensor size and HD video capabilities. Official Canon EOS Rebel T1i Press Release from Canon Inc.
LAKE SUCCESS, N.Y., March 25, 2009 - Canon U.S.A., Inc., a leader in digital imaging, today introduced a new addition to its Rebel line-up, the EOS Rebel T1i Digital SLR camera, the first in the Rebel line to feature Full HD video capture. The new Canon Rebel T1i SLR incorporates some of the best technologies from the EOS 50D and EOS 5D Mark II models into an entry-level juggernaut. With a 15.1 megapixel CMOS sensor and HD video capture, along with the DIGIC 4 Imaging Processor, the Rebel T1i gives aspiring photographers plenty of reason to step-up to the latest and greatest model in the Rebel line-up. The new Canon EOS Rebel T1i raises the entry-level bar with a host of enhanced Canon technologies now available in an entry-level DSLR. Along with the boost in megapixels and Canon’s most advanced imaging processor to-date, this latest Rebel camera has also been enhanced with HD video capture. Plus a 3.0-inch Clear View LCD (920,000 dots/VGA) monitor and user-friendly functions such as Auto Lighting Optimizer, Creative Auto Mode and Canon’s Live View modes, all the right tools to open new doors for imaging enthusiasts. From high-resolution to high-definition, the new EOS Rebel T1i Digital SLR camera helps to give creative consumers a jump-start on the next evolution in digital imaging. The muscle behind the Canon EOS Rebel T1i camera is the DIGIC 4 Imaging Processor with 14-bit analogue-to-digital conversion and the ability to process full HD video. The Canon EOS Rebel T1i Digital SLR offers continuous shooting at 3.4 fps for up to 170 large/fine JPEG images or up to nine RAW images in a single burst when using a class 6 or higher SD or SDHC memory card. Whether capturing wildlife on the run or a child mid-stride on the soccer field, users will appreciate the fast shooting capabilities of the Rebel T1i Digital SLR camera. The EOS Rebel T1i Digital SLR utilizes a precise nine-point Autofocus (AF) system and AF sensor for enhanced subject detection. The new EOS Rebel T1i DSLR provides a cross-type AF measurement at the centre that is effective with all EF and EF-S lenses, while providing enhanced precision with lenses having maximum apertures of f/2.8 or faster. The cross-type AF measurement reads a wider variety of subject matter than conventional single-axis AF sensors and thus increases the new camera’s ability to autofocus quickly and accurately when shooting still images. After the introduction of the EOS 5D Mark II in September 2008, the Company’s first HD video DSLR, Canon has integrated this must-have feature into the new entry-level flagship EOS Rebel T1i camera. The camera features 16:9 720p HD video capture at 30 fps as well as a Full HD 1080p video capture at 20 fps, and a third option to record 4:3 standard TV quality (SD) video capture at 640 x 480 pixels and 30 fps. The video capture mode is part of the camera’s Live View function, using the Picture Style that has been set for Live View still image shooting. The camera allows skilled photographers and enthusiasts to adjust image sharpness, contrast, colour saturation and white balance, and have those settings apply to the movie image as well. When recording video, the camera’s rear LCD screen is letter-boxed by a semi-transparent border to match the aspect ratio of the movie recording size. Like the EOS 5D Mark II model, the EOS Rebel T1i camera will record video up to 4GB per clip equaling approximately 12 minutes of Full HD video, 18 minutes of 720p HD video, or 24 minutes of SD video depending on the level of detail in the scene. Video clips are recorded in .MOV format using an MPEG-4 video compression and sound is recorded using linear PCMii without compression. The camera features a built-in monaural microphone to record sound. To help show off those fantastic movies as well as still photos, the EOS Rebel T1i camera includes an HDMI (High-Definition Multimedia Interface) output to display crisp, clear images on a High-Definition TV. Live mode uses contrast-detection AF with the image sensor and here, as with Quick mode, users can change the location of the active AF point using the Multi-controller. Face Detection Live mode uses contrast AF to recognize human faces. When multiple faces are detected, the largest face closest to the centre of the frame is targeted as the AF point. While Live View is engaged, users can still change settings including the AF mode (Quick, Live, Face Detection Live mode), drive mode, ISO speed, Picture style, White Balance and more. Canon’s Auto Lighting Optimizer technology helps ensure that the subject of each picture is clearly visible by analyzing image brightness and automatically adjusting dark areas in images so they appear brighter. This is ideal when shooting high-contrast situations that include harsh shadow areas, such as landscape images where the foreground is brightly lit and the background detail blanketed in dark shadow. In a scene such as this, the EOS Rebel T1i camera’s Auto Lighting Optimizer technology maintains exposure of the highlight areas while lightening shadow areas for a more enjoyable and evenly illuminated image. 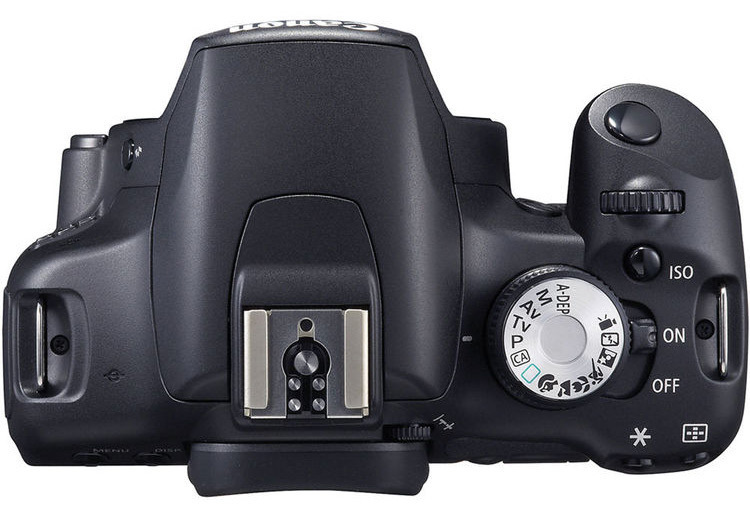 The Canon EOS Rebel T1i also supports Peripheral Illumination Correction for up to 40 Canon EF and EF-S lenses. The Canon EOS Rebel T1i Digital SLR Camera is scheduled for delivery by early May and will be sold in a body-only configuration which includes a rechargeable battery pack and charger, USB and video cables, a neck strap, an EOS Solutions Disk CD and a 1-year Canon U.S.A., Inc. limited warranty at an estimated retail price of $799.99iii. It will additionally be offered in a kit version with Canon’s EF-S18-55mm f/3.5-5.6 IS zoom lens at an estimated retail price of $899.99iv. Canon U.S.A., Inc., is a leading provider of consumer, business-to-business, and industrial digital imaging solutions. Its parent company, Canon Inc. (NYSE: CAJ), a top patent holder of technology, ranked third overall in the U.S. in 2008, with global revenues of US $45 billion, is listed as number seven in the computer industry on Fortune Magazine’s World’s Most Admired Companies 2008 list, and is on the 2008 Business Week list of “Top 100 Brands.” At Canon, we care because caring is essential to living together in harmony. Founded upon a corporate philosophy of Kyosei – “all people, regardless of race, religion or culture, harmoniously living and working together into the future” – Canon U.S.A. supports a number of social, youth, educational and other programs, including environmental and recycling initiatives. Additional information about these programs can be found at www.usa.canon.com/kyosei. To keep apprised of the latest news from Canon U.S.A., sign up for the Company’s RSS news feed by visiting www.usa.canon.com/rss.